For the first time in 108 years, the Major League Baseball season will begin with the Chicago Cubs as World Series champions. Also, for the first time ever, you won’t have to throw four balls in order to walk someone, since MLB has gotten rid of intentional walks as a “time-saving” measure, which is as stupid and ineffectual as cutting NEA funding to “balance” the federal budget. With so much change in the air, it’s nice that there are still a few traditions being honored at the start of the 2017 season. 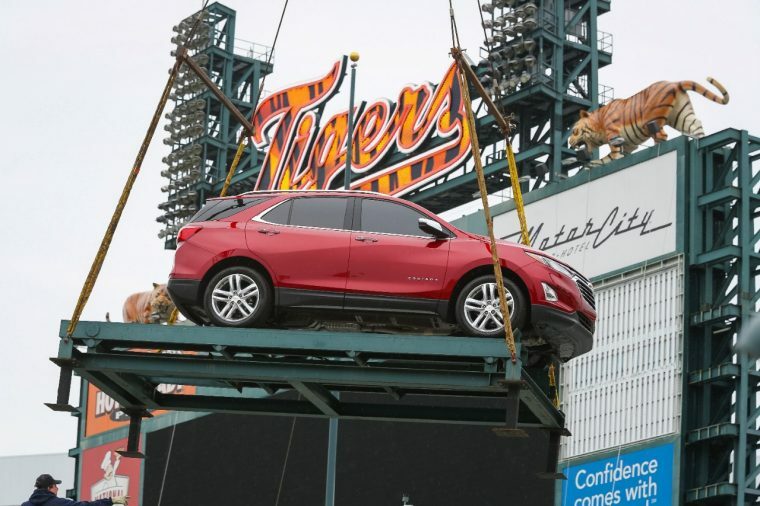 One of those traditions is the annual placing of the new cars on top of the Chevrolet Fountain at Comerica Park, home of the American League’s Detroit Tigers. This year, the two bowtie brand vehicles selected to start in centerfield are the all-new 2018 Equinox and a 2018 Silverado 2500HD. In a press release, Chevy took great pains to note that there were no special weather treatments lavished upon the two vehicles—Chevrolet’s products are already ready for extreme weather. In addition to sponsoring its hometown Detroit Tigers, Chevrolet also acts as the official automotive sponsor of Major League Baseball.